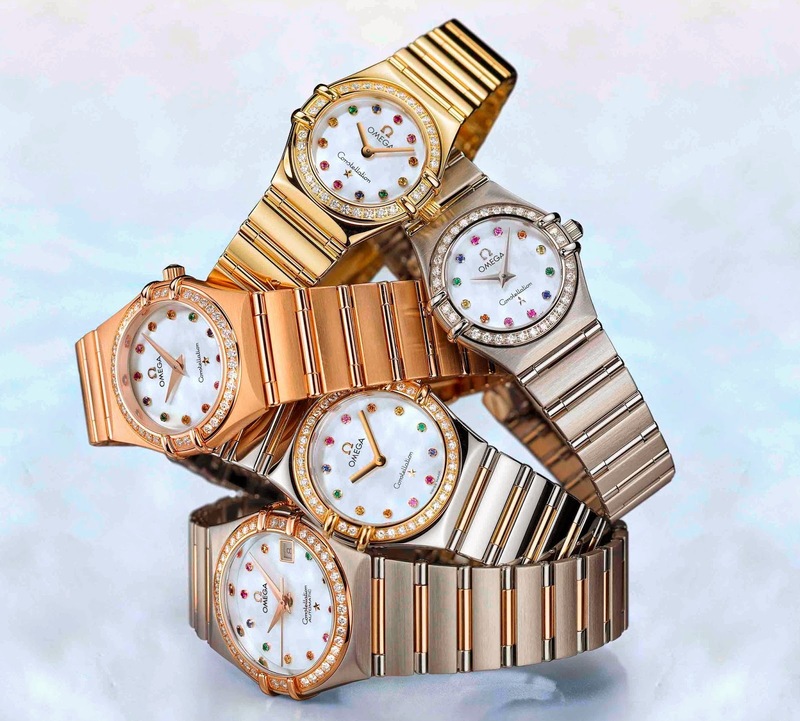 The name of this feminine watch collection comes from the Greek Goddess Iris who protected the Rainbow. Available in women’s 95 and the My Choice versions, the timepieces from Constellation Iris collection 2006 were inspired by the seven Iris limited edition masterpieces made in 2005. 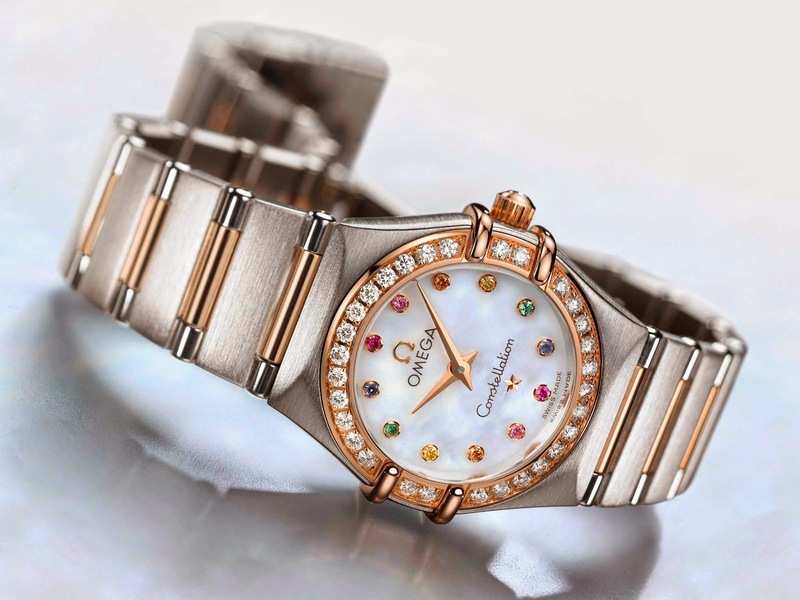 Both the 95 and the My Choice share the iconic claws on either side of the bezel and the smooth and honed lines that are a typical feature of this core Omega range that has stood the test of time since its introduction in 1952. The Constellation Iris 95 and My Choice are available in three sizes and in five different 18-carat gold and stainless steel/18-carat gold combinations. The white mother-of-pearl dial is set with blue, pink and yellow sapphires, mandarin garnets, rubies and emeralds creating a rainbow effect. Depending on the size of the watch, either 30, 38 or 40 diamonds enhance the bezel, punctuated by the four claws at 3 and 9 o’clock. The Constellation Iris My Choice is immediately distinguishable by its streamlined baton hands while tapered and facetted dauphine hands mark the hours and minutes on the Constellation Iris 95. The largest size “Automatic” features a date display window at 3 o’clock. The watch’s domed scratch-resistant sapphire glass crystal is coated with an anti-reflective treatment on the inside and like all Omega watches, the Constellation Iris benefits from a robust construction and high-quality standards that guarantee water resistance to 30 metres. Characteristic of the Constellation, the bracelet is integrated into the case, creating a smooth and fluid look as in this watch, no detail, however small is overlooked. The contrasting satin and polished finishes on the case and bracelet of the Constellation Iris 95 are characteristic of this family, while the Constellation Iris My Choice veers from tradition with an all-over polished finish. The 18-carat red or yellow gold versions of the Iris are the most luxurious interpretations of these newcomers to the family. On the stainless steel/18-carat gold models, details such as the 18-carat yellow gold bezel and “mid bars”, which serve as bracelet links, create a sporty appeal of their own. Like all Constellations, the Omega logo is embossed on the fluted-edge crown and is also to be found in 18-carat gold on the adjustable fold over clasp. 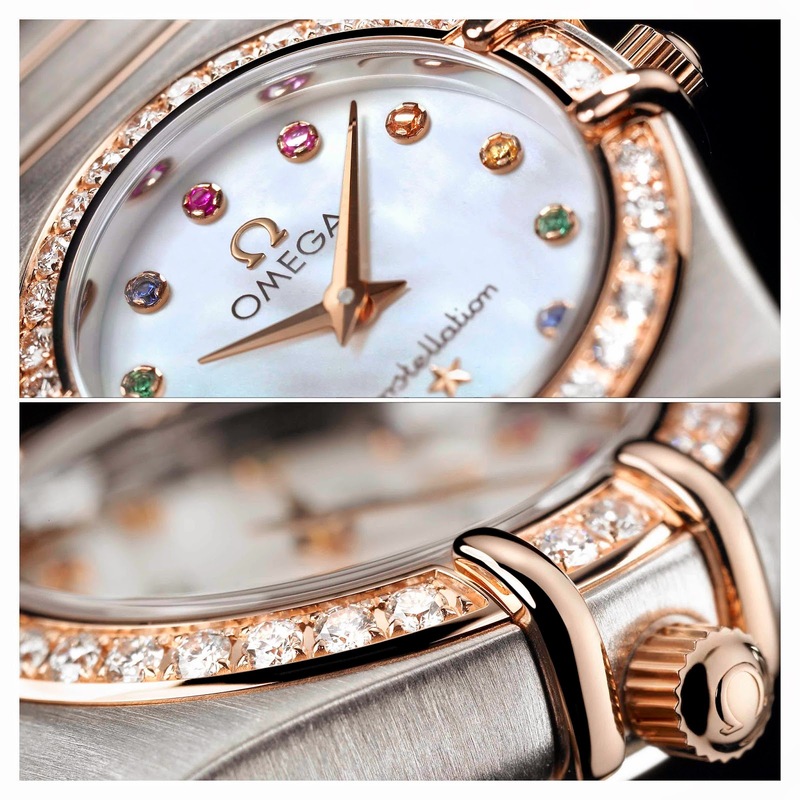 The case back is decorated with a medallion of the Constellation Observatory, a reference to Omega’s associations with space exploration and astronomy and furthermore “My Choice” is engraved on the back of these particular models. The Constellation Iris offers the choice of three different sizes. The “Mini” has a diameter of 22.5 mm, the “Small” 25.5mm and the “Automatic” 27.5 mm. The two smaller sizes are driven by a quartz movement with a battery life of 32 months while the larger size incorporates an automatic winding Caliber 2520. All models are presented on 18-carat gold or stainless steel or stainless steel/18-carat gold bracelets with a fold over clasp.